Pentagon official: Complaints about evangelizing are "relatively rare"
Army Spc. 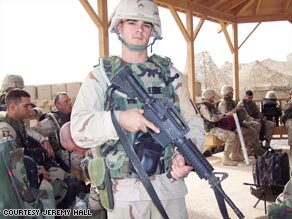 Jeremy Hall, who was raised Baptist but is now an atheist, says the military violated his religious freedom. Like many Christians, he said grace before dinner and read the Bible before bed. Four years ago when he was deployed to Iraq, he packed his Bible so he would feel closer to God. Hall said he met some atheists who suggested he read the Bible again. After doing so, he said he had so many unanswered questions that he decided to become an atheist. "I think it's utterly and totally wrong. Unconstitutional," Hall said. Two years ago on Thanksgiving Day, after refusing to pray at his table, Hall said he was told to go sit somewhere else. In another incident, when he was nearly killed during an attack on his Humvee, he said another soldier asked him, "Do you believe in Jesus now?" "Our Pentagon, our Pentacostalgon, is refusing to realize that when you put the uniform on, there's only one religious faith: patriotism," Weinstein said. Religious discrimination is a violation of the First Amendment and is also against military policy. The Pentagon refused to discuss specifics of Hall's case -- citing the litigation. But Deputy Undersecretary Bill Carr said complaints of evangelizing are "relatively rare." He also said the Pentagon is not pushing one faith among troops. "If an atheist chose to follow their convictions, absolutely that's acceptable," said Carr. "And that's a point of religious accommodation in department policy, one may hold whatever faith, or may hold no faith." Blog: Is the military a Christian organization? But Carr said the military's position is clear. "Proselytizing or advancing a religious conviction is not what the nation would have us do and it's not what the military does," Carr said. The U.S. Justice Department is expected to respond to Hall's lawsuit this week. In the meantime, he continues to work in the military police unit at Fort Riley and plans to leave as soon as his tour of duty expires next year.